E-pistle #18/13 – The Whiskey World In The Wild, Wild, West! Greetings from the West Coast of California. My name is Susan Purnell and there is nothing I like better than enjoying a wee dram while watching the waves crashing on one of the many beautiful beaches in Half Moon Bay. It is the closest I can get to being on Islay without flying 3000 miles! I am a huge fan of the Malt Maniacs and love following everyone’s journeys finding new and wonderful discoveries in the wide world of whisk(e)y. What I have noticed is there is not a lot written about what is going on out here is the WEST and thought it was a great opportunity to let you in on the fantastic products that are being created here. This first e-pistle is to introduce you to some of the many producers who are making outstanding spirits in California and Oregon. Future e-pistles will focus on more technical information in regards to the different styles of whiskey production being use out here. So sit back, grab your favorite dram and come along on a ride through the Wild, Wild, West! History: Fritz Maytag established the Anchor Distilling Company in San Francisco in 1993. His goal was to use traditional distilling techniques and make very small batches of distilled spirits, which include gin, and three styles of whiskey. History: Steve McCarthy started Clear Creek Distillery in Portland, Oregon, in 1985. Steve has brought together the European traditional brandy-making techniques (using Holstein Pot Stills) with the finest fruit from his family’s Oregon orchards to makes many different products including Brandy, Eau-de Vie, Grappa, and Whiskey. 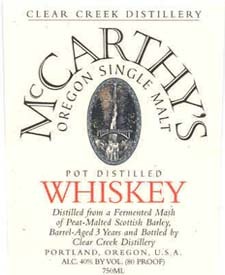 Steve started making McCarthy’s Oregon Single Malt Whiskey in 1996. The mash is made from peated malt barley from Islay. The Widmer Brothers Brewery, who are close friends of Steve’s, made the mash into a wash or unfinished beer, which has not been hopped. Using the unfinished wash allows Steve to get all the flavor and character of the malt during distillation. There are two main differences between the whiskey what Steve makes and Scottish whisky. The first is the type of still which are two Holstein Eau De Vie Pot Stills. The second difference is the use of smaller barrels (55 gallon) made out of air-dried Oregon oak (quercus garriana). The wine makers in Oregon don’t care for Oregon oak, but Steve thinks it is a spectacular success for his whiskey because of their slight oiliness. In 1999 after three years of barrel aging he bottled the whiskey at 40% ABV. History: Domaine Charbay is a family run business located in the town of St. Helena in Napa Valley, California. Mile Karakasevic started Domaine Charbay in 1983. They specialize in small, hand crafted spirits, ports, liqueurs and wines. The four family members, Mile, his wife Susan, their son Marko and daughter Lara are all involved in the business operation. Marko is the current head distiller at Domaine Charbay and is the 13th generation distiller in his family. He grew up around the copper Alambic Charentais Pot stills in Northern California and learned the craft of distilling from Miles. The process of making the Charbay Single Malt Whiskey starts with Two-Row European Barley. Marko feels that the two-row barley has much more flavor and character than the six-row barley. The barley is grown and malted in British Columbia. Miles and Marko are not brewers and in 1999, the beer for their whiskey was made in pilsner style at the Benziger Family Winery, which is located in the city of Glen Ellen in Sonoma. At that time Benziger had a brewery and were planning to make a microbrew beer. The beer was than double distilled in Alambic Charentais Pot stills. Marko uses the Karakasevic 7-fraction distilling technique. I will get Marko’s explanation of this technique for future e-pistles! Miles and Marko distilled twenty-four hours a day, seven days a week, for three weeks! They created 20,000 gallons of beer, which totaled 20 custom-made new America White Oak-barrels, holding 65 gallons each, of whiskey. With the addition of aromatic hops from the been and the rich spice of new American White Oak barrels, this Hop Flavored Whiskey celebrates the ongoing creativity of Karakasevic family’s long distilling heritage. The whiskey is bottled at full barrel strength (60.5% ABV), uncut and not filtered. Marko is hoping to release a seven old year barrel aged whiskey at 40% ABV in late 2006 or early 2007. History: Jim Busuttil started Saint James Spirits in 1995. Jim father was Maltese, and his family has centuries of experience in the wine and spirits business. Jim’s profession is in teaching, but distilling is his true passion. He learned the art of distillation in Germany and Switzerland using Alambic Copper Pot Stills. There is an extensive list of products being made at Saint James Spirits; Brandy, California Gold Agave, Grappa, Kirsch, Rum, Vodka, Wine and Whiskey. As per Jim, “All Spirits are stored and aged in French Oak Barrels. 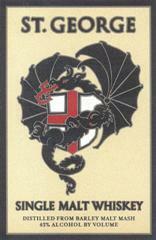 This insures that the Spirits of Saint James are truly one of quality and taste”. Peregrine Rock California Pure Malt Whisky (yes, Jim calls it Whisky), is made from Peated Highland Scottish Barley, and the purest Mountain Spring Water. It is distilled in an Alambic copper pot still from Germany. Aged in American Bourbon casks. Editorial note: You can find some tasting notes on Peregrine Rock (as well as quite a few other whiskeys mentioned on this page in Lex Kraaijeveld’s ‘New World, New Malt Family’ E-pistle that was published in Malt Maniacs #11 in 2004. That article also lists a few other distilleries in Canada and the United States. Check out the Lex-icon for a complete overview of the distilleries we know. Added very recently: the Copper Fox distillery in Virginia. History: St. George Spirits in located on the Island of Alameda, off the west coast of the city of Oakland, on the old Naval Air Station, in The San Francisco Bay Area. Now, that is a mouthful! In 1982, Jörg Rupf fell in love with the San Francisco Bay Area after leaving his home in the Black Forest of Germany and brought a small copper pot still to California. Jörg found that the orchards of Northern California and the Pacific Northwest had a large variety of incredible fruit. The pears from Lake County in Sonoma & Ukiah, raspberries from Oregon and other fruits enables St. George Spirits to produce their extremely high quality eau de vies. The making of eau de vie has lead to the creation of many outstanding products, fruit brandies, grappa, liqueur and single malt whiskey. The oak cask used for maturation comes from a variety of cooperage types with American Bourbon cask making up the majority. French oak casks are also used for hints of vanilla and to enhance mouth feel and Port casks to accentuate the cocoa on the palate. The whiskey is put in cask at 55% ABV.